In the world of email marketing, maintaining a clean list is required… because it ensures that your emails receives record-breaking deliverability rate, reduce bounce rate to an absolute minimum, and save you hundreds of hours of precious time and tens of thousands of hard-earned money in a blink. The cleaning process is very simple. It involves checking each email address on the list whether it is accurate and deliverable or not. Unfortunately, the task is a bit complex and tedious. That’s why today many BIG email marketing firms are spending thousands of dollars every month on third-party email verifiers to maintain a ‘proper’ list hygiene. But, you do NOT have to spend thousands of dollars. Most of the email verifier listed in this TOP 10 list offer a free trial and 100% money-back guarantee. So, you have “zero” risk. So… go through each of these world-class email service providers and choose the ONE that provides you the most thorough, most satisfying, and best deal for maintaining your email list, now. 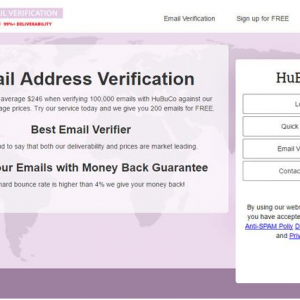 HuBuCo is one of the best email verifiers in town today – for both their deliverability and the prices. 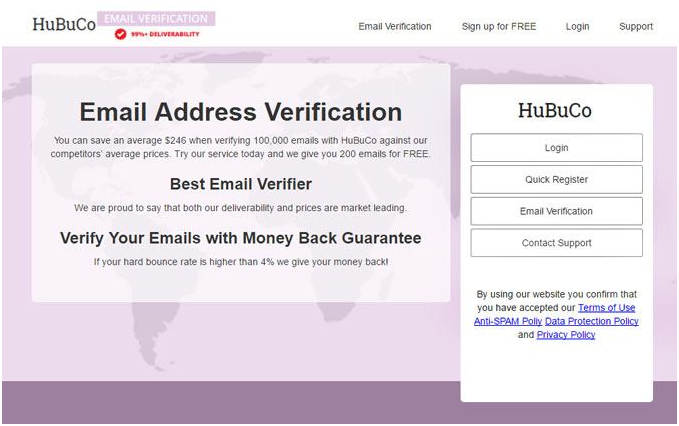 You can save an average of up to $246 for verifying 100,000 emails against HuBuCo competitors’ prices. HuBuCo will also refund your credits paid for unknown email addresses. They’re only one email verification service providers in the block today that considers it’s unethical to charge for unknown email addresses. HuBuCo uses over the top “Hubuco Sendex score” feature so you can check the quality of each email addresses. Each email address is checked one by one sending it through the SMTP verification, MX record checker, email address syntax checker, and DEA detection process. HuBuCo offers 100% money back guarantee! If your bounce rate is even slightly higher than a mere 4%, you’ll get all your money back instantly. No questions asked! 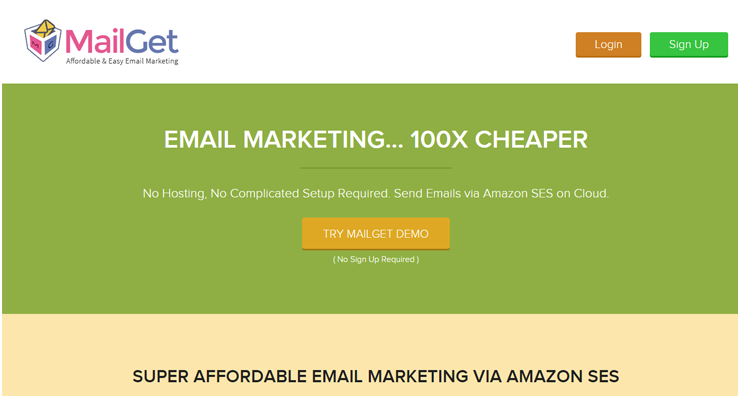 MailGet offers a fresh and affordable email marketing services to all business types and marketers around the world. 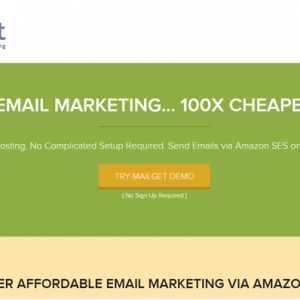 They offer an incredibly easy to use email editor, list cleaner, list management, and autoresponder features, among others. For their ground-breaking email cleanup service, MailGet uses a robust, secure, and very efficient in-built cleanup device. The cleanup tool instantly maintains your list hygiene and gives you back a clean list you can directly market to. It automatically validates your contact list by checking through domain validator, MX validator, and domain validator. 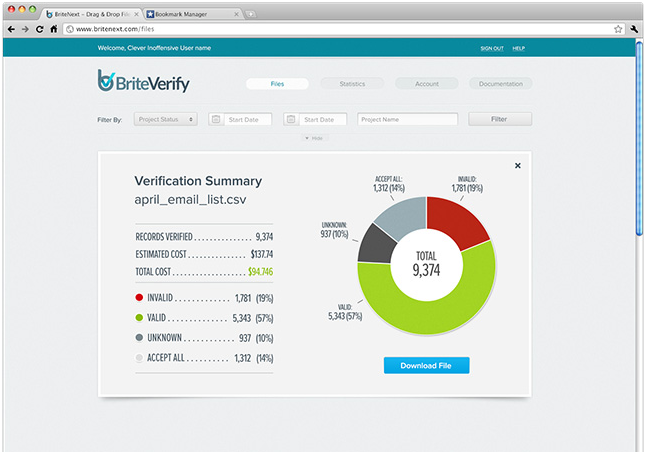 To save cost, their high-end email verifying tool promptly wipes out duplicate email addresses from your list. And the best part is that MailGet offers their exceptional list cleanup services absolutely for FREE, while others don’t. For a list containing 0 to 10,000 subscribers, it’ll cost you only $29/month (for sending UNLIMITED emails), while Amazon SES will cost you $1 for every 10,000 emails sent. 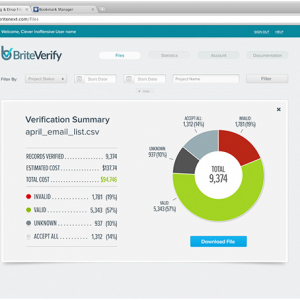 BriteVerify is another email verifier that offers a really simple, easy to use, and reliable email verification tool for validating and verifying yourcontact list… before you actually send emails. In doing so, you’ll improve your list hygiene as well as boost your marketing efforts significantly. The real-time email verification service is fast as a shark, trustworthy as a dog, and 100% accurate as a focused hawk. BriteVerify leaves no stone unturned. Their top notch tool investigates every email addresses in your list and confirms them as either valid, invalid, or unknown. Their impressive tool also checks email addresses for expired domains, role accounts, spam traps, disposable emails, and then separate them accordingly. BriteVerify offers an easy pay-as-you-go pricing package. So, it will cost your around $500 to verify up to 50,000 contacts, which is not cost-effective, in our opinion. 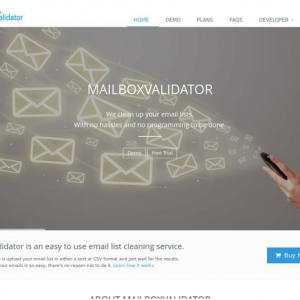 Email-Validator is another big player in the list cleaning niche. 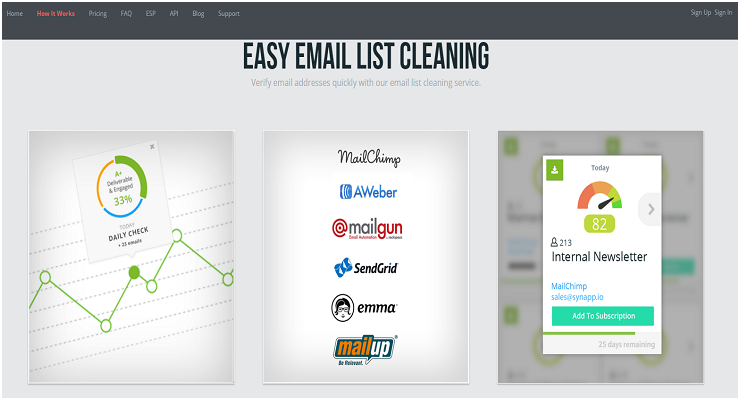 They offer cost-effective, user-friendly, and efficient list cleaning services from which you can verify your bulk email addresses. list for email campaigns, almost overnight! 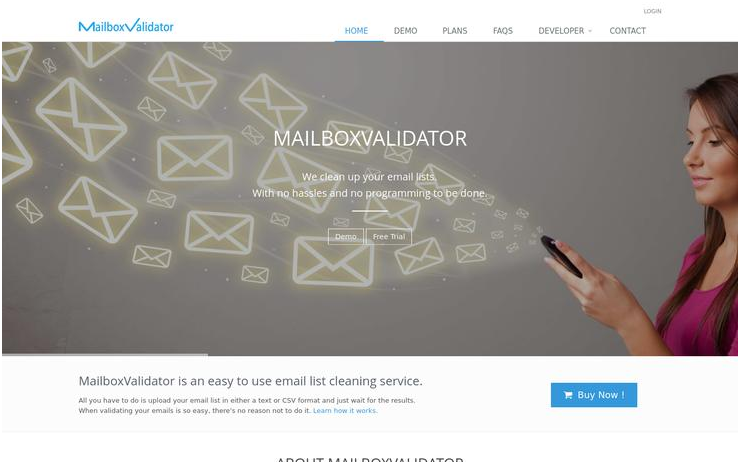 For cleaning your list, for example, Email-Validator checks the validity and accuracy of each email addresses on your list by sending them through several necessary processes such as DNS validation, syntax verification, SMTP connection, DEA detection, and duplicate address removal, among others. Once they do all this, they’ll immediately send you back your verified email list. Email Validator offers two payment plans: a) pay-as-you-go pricing option, and b) a subscription based payment method. In the pay-as-you-go payment plan, you’ll pay $225 for verifying 50,000 email addresses, while in the subscription plan, you only need to pay $175 for 50,000 email addresses verification. Graphic Mail offers several email services, including contact list cleaning service. Graphic Mail verifies each email addresses on your list, removes out outdated and non-existent email address so that your bounce rate of your contact list goes down to an absolute minimum as humanly possible, while the deliverability rates of your emails are fired up, instantly. Graphic Mail charges you mere $125 for validating and cleaning up to 50,000 contacts (almost $100 cheaper than Email-Validator’s subscription-based plan). For cleaning more than 1,00,000 email addresses, you’ll have to communicate personally with them. 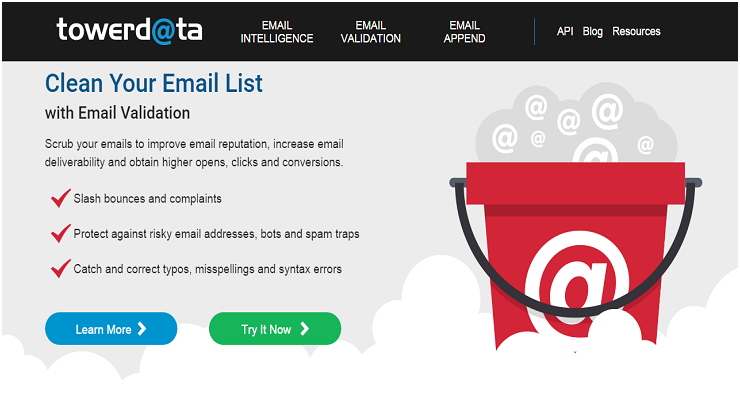 TowerData stands tall and BIG among many other email list verifiers out there. … and adding new email addresses to expand their marketing reach. 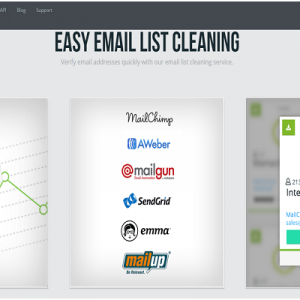 TowerData’s amazing cleaning tool provides fast, secure, and solid bulk email list cleaning service. It keeps its skeptical eyes on every contact by thoroughly checking their email addresses for any email correction, spam trap suppression, mailbox check, and domain check, and email activity metrics… so that you receive a highly reliable and accurate email address that you can immediately market to. The first 1,000 email address verification is FREE! 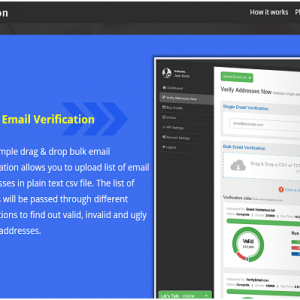 However, if you want to verify a massive bulk of 50,000+ contacts, you’ll pay a lump of $500, which seems scary at first, but if you consider the awesome quality of their email verification service, you won’t hesitate to invest. If your email reputation is on the line because of bad, undelivered, and heavily bounced emails, then your absolutely going to fall in love with MailboxValidator. Their fully automated system not only boost your email delivery success rate (by cleaning undelivered and bounced emails from your mailing list), but also creates a full summary of all the good, the bad, and the ugly emails and domains, among other crucial data. For list cleaning, it checks each email under a microscopic level to ensure the username is registered with the domain name. The built-in fraud protection platform will knock your shoes off because it scans every email addresses in the list… to ensure no address is associated with a known scammer or are from temporary accounts. They boast themselves of cleaning and verifying up to 96%. That’s quality service, don’t you think? The cost for cleaning 1,000 contacts is only $19.95, however, the good news is that the price instantly goes down as the demand increases. That means you can instantly clean up over thousands of email addresses by sorting out fallacious, wrong, and temporary email accounts with a hyper-detailed report on it. The cleanup process is highly sophisticated. Each email address goes through a meticulous examination that determines whether the email address syntax is correct. The MX record checking begins after that, followed by DEA detection and role address detection method, and finally, completes with the mailbox existence checking. It also provides a special report that tags each list as “Safe to Send” to dramatically double or even triple deliverability rates, almost overnight. 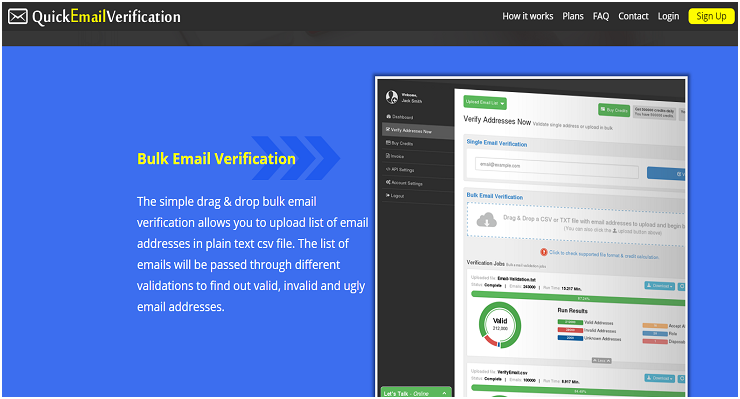 The first 1000 email address verification is absolutely FREE! And you pay only $200 for cleaning 50,000 emails. 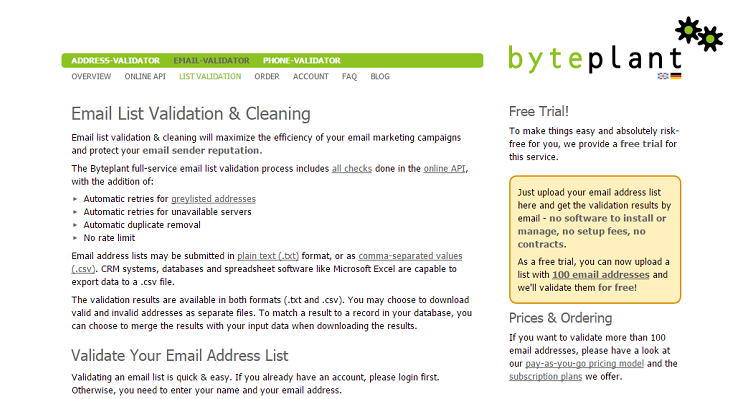 Data Validation also offers top notch list clean up services, but they do more, too – for e.g. 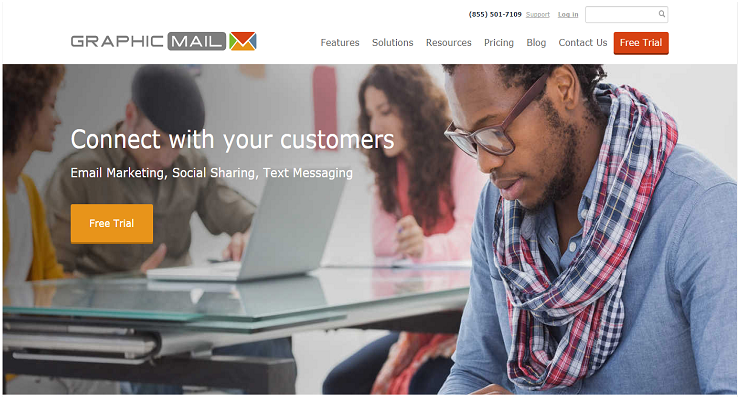 report generation, daily monitoring services, and multiple integrations, among other email services. 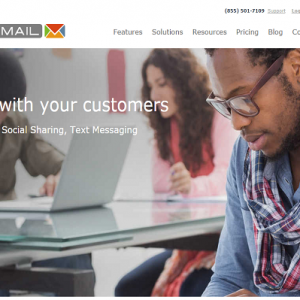 Their email validation is fast, comprehensive, and highly reliable. 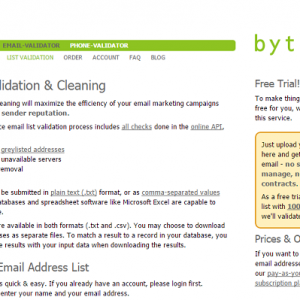 Data Validation cleans up your email list through a number of high-tech verification process such as MS lookup, SMTP check, DNS verification, internal database access, mailbox check, deliverability and compliance check… so that, at the end of the day, you get the MOST reliable, accurate, and highly responsive list for promotion. Not to mention, they also offer a FREE email list quality report card so that you’re sure how many emails were cleaned, how many removed, and how many checked for deliverability. Data Validation offers it email verification services for different pricings depending on your demands. For example, to clean up 50,000 contacts, you’ll pay about $250. But if you need to clean up more contacts, the cost will drop down significantly down. 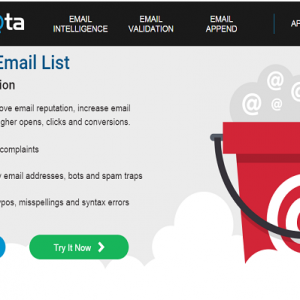 ListWise, built by the renowned mailing list company Optimizer, is a remarkable email validation tool that maintains list hygiene to significantly increase your marketing efforts, almost overnight. It cleverly cleans all the email addresses in your list, and weeds out all the duplicates and bounces… so that you get a highly responsive list that is marketable-ready. 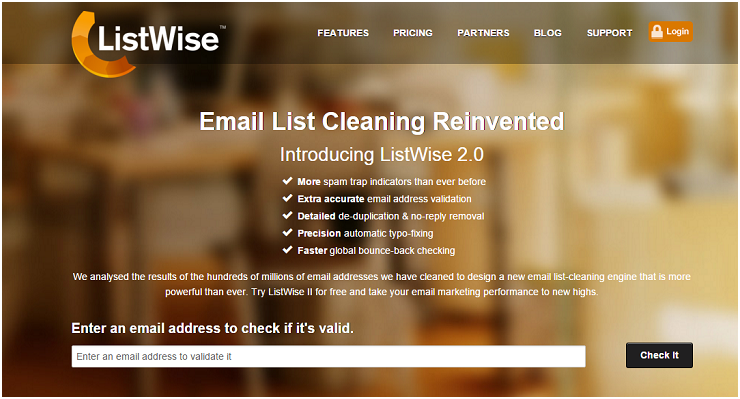 ListWise offers several wonderful email cleaning services such as removal of duplicate, bounced, invalid email addresses on your contact list. list to promote your products and services. Once the cleaup is done, you can easily download the cleaned list on your computer. 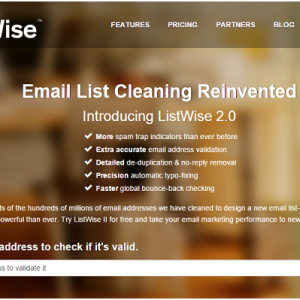 ListWise cleanup service is FREE for the first 100 emails. For list more than 100 contacts, they’ve got two payment plans – a) prepaid plan and b) monthly plan. In the prepaid plan, the cost of maintaining 50,000 contacts is only $109, while it’ll cost you a meager $86 per month for validating 50,000 addresses. Go through the list of top 10 email list hygiene again, and choose the ONE that offers the best bargain for your needs. As far as we’re concerned, we think MailGet offers the best cleaning services, almost for FREE. Feel free to acknowledge me about your thoughts in space provided below.